This is a multilingual country. Cut flowers like Roses, Carnation & Alstroemeria are grown in abandon. Gypsophila, Lilies Eryngiums, Arabicum, Hypericum, Statice, are also grown here. Flower gifting is mainly reserved for occasions like Birthdays, Anniversaries & House-warming. Kenyans prefer simple & practical gifts. Christmas is celebrated with much funfair & sending flowers on Christmas Eve is never missed. When you are invited for a meal make sure you bring pastries or flowers. Send flowers same day to Kenya using our local florists & flower shops. Order by 12 noon. Send Easter Flower Arrangement, Easter Hampers & Gift Baskets to Kenya. Send Roses, Carnations, Lilies throughout Kenya for occasions like Birthdays, Anniversaries, Funerals, etc. Enjoy affordable flower delivery across Nairobi, Mombasa, Nakuru, Kisumu & nationwide delivery. We at Flora2000 bring together elegant designs, guaranteed on time flower delivery, personal care, and the finest quality to offer you luxurious floral arrangements for those special occasions. Send flowers and make special occasions even more memorable for your loved ones by delighting them with enchanting ensembles. Rely on us to send flowers online across the country to Leeds by choosing something stunning from our lavish collection of bouquets and exquisite gifts. How do i send International Flower Delivery to Kenya? 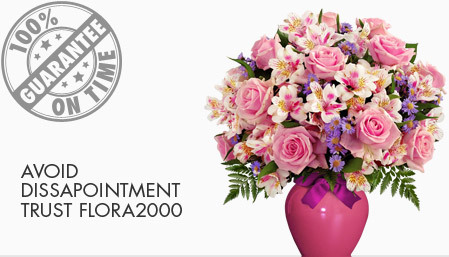 Flora2000 has transformed International flower delivery to Kenya into a fine and effortless art. With our efficient flowers & gifs delivery services worldwide; you are sure to find the perfect expression of your message to your loved ones. Be it Roses, Lilies, Carnations or Cakes, our gifts are sure to make both the sender and the receiver happy. We make sure the gifts you give reflects what you feel about the receiver. Kenya is a multilingual country. Cut flowers like Roses, carnations, and Alstromeria are grown in Kenya. Gypsophilla, Lilies Eryngiums, arabicum, hypericum, Statice, are also grown in here. Gift giving is mainly occupied for events of significance in a person’s life or a religious significance. Kenyans prefer simple gifts, you can also opt for practical ones. servants, trades people and service workers are rejoiced with presents during Christmas. When you are invited for meal at home, make sure you bring pastries or flowers or sweets. Avoid gift giving using the left hand. Celebrate the resurrection of Christ (Easter)on 21st April with Flora2000 by sending EasterFlower Arrangement, Easter Hampers & Gift Baskets. Easter is celebrated on the first Sunday after the first full moon following the northern spring equinox. The week before Easter is also referred as the "Holy Week". Handy tips for Easter gifting this year. 1. Lily is the most prominent choice of flower for Easter. Traditionally White lily symbolizes happiness while Yellow lilies show ‘live for the moment’. 2. White flowers are the foremost choice as far as colour goes, but you can send a colourful arrangement made of Pink Lilies or Mixed Coloured Roses in a woven basket. 3. Another good choices for Easter include spring flowers like Daffodil, Tulip, Rhododendron& Azaleas. Our exquisite collection of flowers & Gifts for Easter. We have an exclusive collection of flower arrangements, hampers & baskets for this Easter. Our classy collection of flowers & Gifts for Easter to Kenya.